I ran my first full marathon in November and as I was completing my training, I came across this quote about quality improvement from V. Daniel Hunt, quality management improvement author and CEO of Technology Research: "Quality is not a sprint; it is a long-distance event." I never thought to make the comparison between training and running a marathon and establishing a company’s quality improvement program, but after my experience preparing to run 26.2 miles, I found that there’s actually a lot in common between the two. 1. Preparing to run 26.2 miles is a lot like preparing to start a quality improvement initiative. 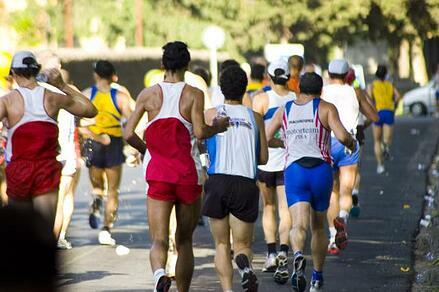 To say that running a marathon is merely a “long-distance” event is an understatement. I ran track and cross country in high school and I remember the longest distance I ever raced was around 3 miles. The 26.2 miles of a full marathon are no joke and required a lot of planning for me to be able to finish. I searched around for training plans on the Internet, read a lot about diet and nutrition for runners, and scheduled runs and workouts based on my ability level and the time I knew I had to dedicate to training. If you’re starting a quality improvement program, or even if you’re just preparing to start a few projects, you might do the same … educate yourself about different methodologies, and do a lot of planning about how you’re going to choose and carry out your projects. I downloaded different running apps for my phone to track my mileage per week, and if you’re looking to track the progress of your projects you might use DMAIC to organize your project, or software like Companion by Minitab to manage and track all the elements of your quality projects as you work through them. How can I start my Lean Six Sigma initiative? 2. Actually running the marathon is a lot like implementing your solution for quality improvement. I found that actually running the marathon was among the easiest tasks in my marathon journey. The previous months of training and logging 30-40 miles per week made the actual marathon day seem easier. All I had to do was show up that day and run the race. Similar to the training portion of marathon running, planning for a quality improvement project involves a lot of time identifying areas of improvement, forming a team, goal setting, process mapping, and analyzing root causes before you come up with a solution. And the implementation of your solution usually takes much less time than the all the groundwork you did come up with the solution for improvement. 3. Recovering from running a marathon is a lot like pilot-testing your plan. I’m not going to sugarcoat it—running a marathon was tough! However, I think the recovery process was even tougher. My muscles were so sore that doing stairs or any sort of activity that involved leg-bending was very difficult for 5-7 days. Sometimes it takes even longer to recover, but usually seasoned runners take just a few days before their bodies are back to normal. Similarly, I liken the ‘recovery’ period of running a marathon to the pilot-testing or ongoing monitoring stage of the testing of your improvement solution. Occasionally you might find the plan you have to improve a process isn’t consistent, or it really doesn’t improve the process or save money like you thought it would. In these cases, you might have to completely nix the idea and go back to square one—researching a new idea to improve your process. However, sometimes the monitoring phase of your improvement plan goes smoothly, like the recovery process of a seasoned marathon runner. Maybe after a few days of pilot-testing, you realize your improvement tactic is successful—really saving you time and money, becoming the new “better” way of completing your old process.